After Nearly Four Hours In Open Court Debate A Maricopa County Judge Rules Beijing Garden Restaurant in The Phoenix Chinese Cultural Center Can Stay Where They Are for Now! Judge also Orders Investment Banker David Tedesco and his Company 668 North to Turn the Electricity Back On, Turn the Phones Back On and to Refrain from Harassing the Restaurant Employees or Customers! 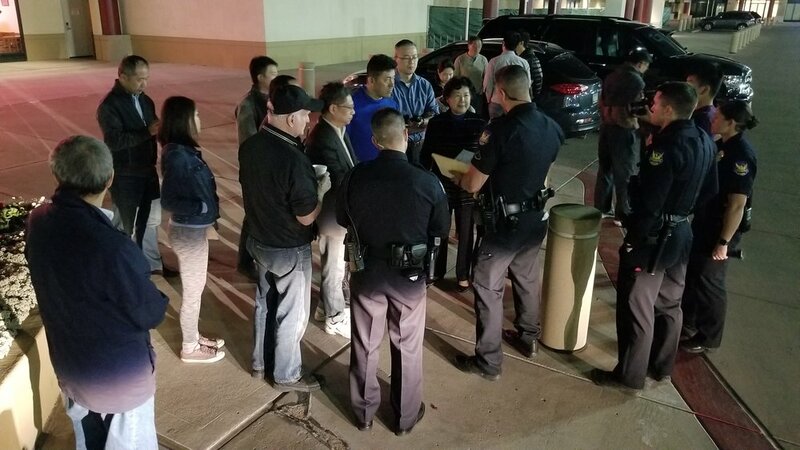 March 13, 2018: Chinese Americans in Phoenix, Arizona continue their hard fought battle against an investment banker who wants to turn the iconic Chinese Cultural Center and Prayer Garden into just another office building. On Tuesday afternoon, Maricopa County Superior Court Judge Christopher Whitten held an emergency hearing to decide whether to approve the request of 668 North, LLC, part owner of the Cultural Center, to “kick out” Chinese owned business Beijing Garden Restaurant, even though the restaurant has 5 years left on their lease. The court said no to the investment banker’s request. The hearing followed a tumultuous two weeks in which 668 North representatives attempted to drive the small restaurant out of the Cultural Center by cutting their phone lines and internet connection four times, turning the electricity off twice, threatening to have workers and even customers arrested for trespassing, and dismantling the kitchen exhaust and fire emergency systems to prevent the restaurant from cooking. Despite this harassment, the owner of Beijing Garden Restaurant and his employees pressed on, at times serving loyal customers without the benefit of lights, credit card service or a fully functioning kitchen. At the hearing, the judge told Christopher Payne the attorney representing 668 North, that he couldn’t believe the things he was hearing, adding “...if they are true, they are not only horrible, they are criminal.” The judge then warned Mr. Payne that if he is advising his client to do these things “you may be heading across the street” to the criminal division as a defendant. It should be noted that as the judge chastised Mr. Payne for nearly 15 minuets over what may be criminal conduct by his clients, True North in house attorney Andrew Christensen and property manager Rob Reblin, two police detectives sat in the back of the courtroom. They were there to observe the proceedings first-hand, since there have been countless calls for service at the Cultural Center this month relating to 668 North’s activities at the Center. At the end of the hearing, the judge ordered that the electricity should be turned on, the phone service and Internet service turned on, and that orders of protection from harassment be put in place to allow both sides to do business peacefully. Attorney for the restaurant Jack Wilenchik asked the Court to set the case for jury trial next month. The court agreed and the trial was set for Monday, April 16, 2018. The court denied 668 North’s request for an injunction, which would have forced the restaurant out of its space, which it has occupied for the past 5 years. 668 North is a division of True North Company, Scottsdale. True North owns and operates Realty Executives, Passport health, and Pump It Up (Fun Brands). The companies are owned and operated by David Tedesco of Scottsdale.